Why are words underlined in red? The language of the text is detected as soon as you start typing it in. You will begin to see translations after entering the first word. To change the source or the target language, click the language and choose the language you need from the list. To switch the translation direction, click the button. In the source text, select the word you want to translate. Click . You will see a pop-up message “Translation copied”. Start entering the text you want to translate. The app will show suggestions for the current and the following words. Simply press the Enter key on your keyboard or click the suggestion with your mouse cursor when the suggestion pops up. To discard the current suggestion, press the Esc key or simply keep typing text. You can use the on-screen keyboard to enter text in the language you need (no matter what language is set for your current keyboard). To do this, click . You can use your mouse to click the characters you need. In addition to text translation, Yandex.Translate offers detailed dictionary definitions that include translations grouped by meaning, usage examples, parts of speech, and phonetic transcriptions (for English words). Dictionary entries are displayed underneath the translation result. The service also provides synonyms and similar expressions for words and phrases in Russian, English, Ukrainian, Belarusian, Spanish, Italian, German, Lithuanian, French, Finnish and Hungarian. Yandex.Translate underlines words in red if they contain typos or errors (in English, Kazakh, Russian, and Ukrainian). To replace the underlined word, click on it with your mouse and choose one of the available options. In the dictionary entry under the translation result, click the link with the word to get a transcription for. Translate a word or text. Click . You are not signed into Yandex.Translate. The source text or the translation exceeds the maximum allowed limit of 300 characters. The Favorites list is already full (you can't store more than 100 translations). You can delete old translations from your list and save new ones. By default, to insert a line break in Yandex.Translate, you must press Shift + Enter. To use the Enter key, click and turn off the option Press Shift+Enter to insert a line break. Click the name of the language in the block with the source text and uncheck the Auto detect box. If you find an error in the translation of a word or text, click . Enter your suggestion for a translation and then click Send. 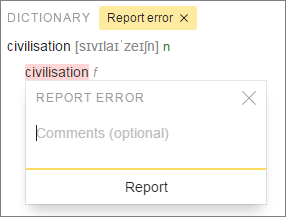 If you find a problem with a dictionary entry, first click Report error. Then click the word that is erroneous. If need be, you can leave a comment in the pop-up window that appears, before clicking Report.